Yep, they were orange flavored...loved them! I love your site! It's taking me down memory lane! 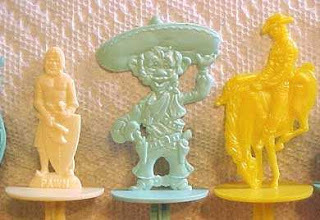 The treasure sticks were wiped from my memory until I saw your blog and then, suddenly, I remembered them! How fun! We called the screwballs cannonballs on the East coast. They were actually vanilla ice cream swirled with orange sherbet and I loved 'em! Believe it or not I just found some buried treasured sticks at a yard sale in Port Dover Ont. Really elderly man sold them to me for $2. I wrote on my blog about them when I went looking for pictures and found your blog. My thought was..."Oh good it's not just me"
I used to eat these as a kid back in the very early 1960's. These are odd...they come and go. 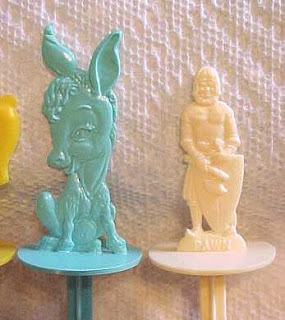 but remember eating these with my parents on a hot summer day on our porch around 1963. Great item they should bring back. 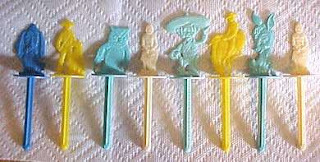 We are collecting all the Buried Treasure Ice Cream Plastic Character Sticks. 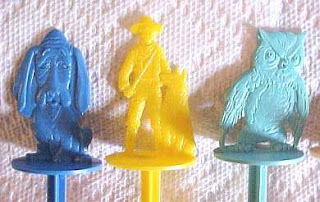 There were many, many different figure characters and each character came in a variety of colors. Can anyone tell me what company made the Buried Treasures ? Take a sentimental journey down memory lane with lots of pictures of Buried Treasure Ice Cream Sticks and informative historical information of their origin. I just found this little 'treasure' on the net by off - chance. I and a neighbour were only reminiscing about growing up. The subject of Buried Treasure ice cream came up. I used to love them! If I close my eyes I can still vividly taste them. I wish that they were still available today, I would have no trouble scoffing one down with glee! Well, I never thought that I would get anywhere when I entered my search. Well Sweethearts! Can't help but love this internet! Happy reminiscing folks!